History: The Knights Landing Ridge Drainage District was formed by a special act of the State Legislature, which was approved on April 30, 1913. The Drainage District has, since it’s formation, operated in conjunction with R.D. 108. Reclamation District 108 is a Special District and a political subdivision of the State of California. The District was established in 1870 and reorganized on July 22nd, 1919 under the California Water Code, Section 50001. Provided Services: Acquire easements, property and material necessary for levees, canals and other drainage purposes. Revenues: The Knights Landing Ridge Drainage District is funded through an assessment levied upon it’s beneficiaries. 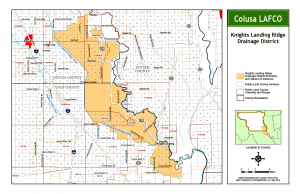 Knights Landing Ridge Drainage District is within Yolo County. Monthly Meeting, Contract Opportunities and Annual Financial Info for Knights Landing Ridge Drainage District (KLRDD) can be found under the respective tabs on the Homepage. Jim Heidrick is the CEO E & J Farms. He grows tomatoes wheat and alfalfa. Roger Cornwell is the General Manager of River Garden Farms. In addition to KLRDD, he serves on the Board of Reclamation District 108, and Northern California Water Association. Fritz Durst is a sixth generation grain farmer in the Sacramento Valley. He became an early adopter of no-till and soil conservation farming methods in order to revitalize Tule Farms, his family’s 6000 acres in the Dunnigan Hills outside of Woodland, CA. Herb Pollock is a fourth generation Yolo County farmer producing wheat, corn, safflower, sunflower seed, vineseeds, and walnuts. He and his wife, Lynnel, have two sons who are also involved with the farming operation. Herb has served on various agricultural boards for many years, including the Yolo County Farm Bureau, Yolo Farm Supply, and CalWest Seeds. He presently is a board member of the California Corn Growers and the Knights Landing Ridge Drainage District. Dan Tibbits is a landowner within the District. Prior to his current position as Principal Engineer at Sacramento Area Flood Control Agency, Mr. Tibbitts had been serving as Project Manager for 10 years with the U.S. Army Corps of Engineers. Each board member serves a 4-year term. Board members may be contacted at the District office at 530-437-2221. Knights Landing Ridge Drainage District pays its Commissioners $10 per meeting plus mileage. When there is a vacancy on the Board of Commissioners, candidates may file for the office of Commissioner, provided that each candidate is either a landowner or a legal representative of a landowner. Official declarations of candidacy may be obtained from the District office. Appointment to each office will be made in the event there are no nominees or an insufficient number of nominees for the office and a petition for an election is not filed with the District. The election will be conducted by an all-mail in ballot and all ballots must be returned to the District’s office by mail to P.O. Box 50, Grimes CA 95950 or in person at 975 Wilson Bend Road, Grimes CA. The election will be conducted in accordance with Division 15 of the California Water Code and applicable provisions of the California Elections Code. Individuals who have recently purchased property in the District are eligible to vote and should call the District Secretary immediately at 530-437-2221 to obtain a ballot. A copy of the procedures for elections is available for public inspection at the District office located at the above address.